Renault launches its range of rear-wheel drive Master Cab/Chassis heavy-duty vehicles that offer twice the payload and up to twice the load-space of a regular ute, yet a comparable price. The Renault LCV offer is now expanding into new market segments with a proven, competent, well-equipped and versatile range that can be configured easily to suit a variety of hard-working applications, while at the same time delivering driver and passenger comfort, thanks to a choice of spacious, safe and well-equipped cabs. The 4.5-tonne GVM Renault Master Cab/Chassis vehicles can all be driven on a regular car licence, and are offered with a choice of 6-speed manual or advanced 6-speed ZF-sourced “Quickshift’ automated transmissions. The rear-wheel drive Master Single Cab comes in a choice of two chassis lengths, giving body-builders plenty of scope to meet customer requirements, from refrigerated boxes to tradie-friendly flat-top trays, while the 7-seat Dual Cab allows the entire crew to travel in style to the worksite. The Dual Cab offers a terrain-gripping Eaton automatic differential lock as standard (optional on Single Cab), to deliver excellent traction on the typically loose and slippery surfaces found on construction sites, rural properties, or unsealed roads, precluding the need for a more expensive and often superfluous all-wheel drive solution. The Renault Master Cab/Chassis offers a substantial payload of up to 2.5-tonnes, with an additional 3-tonne towing capacity, thanks to its dual rear wheel set-up (using 195/75 R16 tyres on 5.5J 16 rims) and robust multi-leaf rear suspension. A high level of safety equipment comes as standard, including dual airbags, ABS and Electronic Stability Programme with ASR traction control, cruise control and variable speed limiter, and even a brake pad wear indicator. Comfort and convenience features abound, and include remote central locking, Bluetooth hands-free connectivity and audio streaming, air conditioning, multifunction trip computer, a multitude of drinks holders, chilled glove box, overhead storage, and power front windows. A broad array of customer-selected options includes a locally sourced alloy or steel drop-side tray; satellite navigation, and a rear view camera as well as an Isringhausen driver’s suspension seat. Mechanical options include a transmission-driven Power Take Off and a towing pack. A number of the options are bundled together as a Safety & Security Pack, comprising auto headlights and rain sensing wipers, dual head and side airbags (non-suspension seat versions), fog lights, rear demister, alarm and headlights with cornering lights. The Premium Pack for Cab/Chassis models features an integrated sat-nav system, storage compartment under passenger seat, an additional large door bin, glasses storage and A4 dash top document compartment lid. 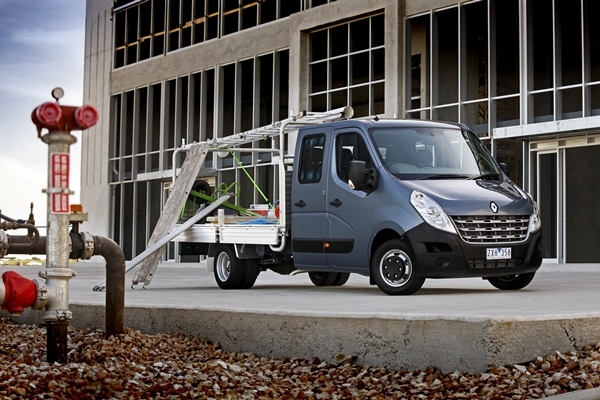 The Renault Master Cab/Chassis models feature the just updated 2.3-litre turbo-diesel, direct injection, 4-cylinder engine, as used in the front-wheel drive Master van range. This produces 110kW and a substantial 350Nm of torque between 1500rpm and 2750rpm. Like all Renault Master vehicles, the new Cab/Chassis range is able to travel as far as 30,000km between service intervals, depending on its working environment, thanks to a new oil condition monitoring system. Like the van variants, the Master Cab/Chassis will be available with a choice of a 6-speed manual gearbox or 6-speed with automated ‘Quickshift’ (no clutch pedal), although the rear-wheel drive configuration uses a new ZF sourced gearbox that has electrical actuation of the clutch for very fine manoeuvring, for example when negotiating the entry into a loading dock. The maximum front axle load is 1850kg while the rear axle takes 3200kg. The Master’s cabin is one of the most comfortable around, with a multitude of stowage cubbies, and a swivelling laptop table is fitted to the back of the folding front middle seat. Underseat storage is a convenient feature for customers who carry high value tools, with cubbies under the front and rear seats available. Dual Cab versions offer up to 7 seats, thanks to a ‘4-across’ rear bench. This flexibility is sure to make the Renault Master Cab/Chassis popular with customers who have work crews to ferry to job sites during the week, or mates to take fishing or to the boat ramp on weekends. The Master Single Cab offers a choice of wheelbases, 3682mm or 4332mm, while the Dual Cab is only available in 4332mm. The longer Single Cab model can be built up to an overall length of almost 8-metres, of which almost 5.5-metres is load area. In addition to appealing to tradesmen, the Cab/Chassis also lends itself well to the installation of a refrigerated box for food transportation, freezer units or simply a large box for removalists. Renault is offering the Master Cab/Chassis with a 3-year/200,000km factory warranty as well as 3 years of Roadside Assistance, and Capped Price Servicing for the first 90,000km or 3 years, whichever comes first. The Single Cab variant is priced from $45,490 and the Dual Cab from $50,490. The Quickshift automated transmission adds $2,500. Pricing is Manufacturers’ Recommended Retail Price, and does not include on road costs or dealer delivery. In Europe, Renault has been the leading supplier of light commercial vehicles for the each of the past 15 years. The Renault Master Cab/Chassis variants are available now through the national Renault Dealer Network. “The arrival of the Master Cab/Chassis range means we now have the ability to reach into new sectors of the LCV market, particularly the construction and agriculture industries, food transport, councils and authorities,” says Lyndon Healey, Renault LCV Brand Manager. “The Master Cab/Chassis range gives us a strong and comfortable workhorse for tradesmen who need a large capacity tray and excellent towing abilities. “The Dual Cab version is expected to be especially popular, not only with work crews, but with tradesmen’s families who need more space than a traditional double-cab ute, and still want to enjoy car-like comfort. “We have specified the Renault Master Cab/Chassis range to suit Australian conditions and we are confident it will prove to be a winner for this market,” he says. In celebration of its 30th year as Australia’s leading high-performance car manufacturer, the HSV Maloo R8 LSA will benefit from a power and torque upgrade to 410kW / 691Nm.